Boo! Scared you didnt I!?!?! You've found my Great Pumpkin Day Blog! Here you will find all my favorite halloween things! Enjoy! This is going to be where I put all my halloween information to share with the world. I love Halloween, probably because its in the Fall , my favorite season, and also, its the start of the holidays and for me...CHRISTMAS!!! So Great Pumpkin Day is celebrated on the 31st or sometimes the 13th. I will be adding lists about my goals for GPD at a later date, when I get the lists made. Hi, im Randee! Im a mother of two great kids. I love planning things! I love all the holidays, so check out all my blogs! 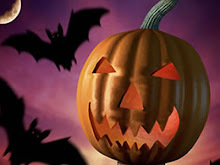 Favorite Halloween sites! Beware! Not for the faint of heart!